Luminarium Dance received funding from the Arlington Cultural Council for “Night at the Tower,” which transformed the Arlington’s Park Circle water tower through film projections and live dance. That project subsequently received a prestigious Gold Star Award from MCC’s Local Cultural Council Program. Luminarium will be presented with the award at the 5th Annual Gala and Showcase at Arts at the Armory in Somerville on Sunday, June 21, 2015, 5-8 PM. We asked Luminarium co-founder Merli V. Guerra about the award, the unique voice of Luminarium, and what’s next for the daring, interdisciplinary dance artist and her collaborators. What are the origins of Luminarium Dance? My co-director (Kimberleigh A. Holman) and I first founded Luminarium Dance Company back in June of 2010, based on our shared passion for exploring the intersections of light and movement. Between her skills in theatrical lighting design and my work with video projection, our company quickly took off, and we’re now just days away from celebrating our 5th anniversary as an award-winning modern and contemporary dance company that is regularly hailed for its unique work in the arts. Is there something that unifies all of the work that Luminarium collectively does; what aspect of your “voice” can be found in all of your own work? The work Luminarium creates – be it conceived by myself or my co-director – continues to be linked to the company’s mission. The word “luminarium” literally holds two meanings: 1. a body that gives off light, 2. sheds light on some subject or enlightens mankind. At times, our work delves into the physical mechanics of merging dance with new lighting onstage; at others, the work seeks to metaphorically enlighten the audience on the subject at hand. So what is this voice? Stylistically, my movement stems from the two very classic trainings of ballet and classical Indian dance in the Odissi style. Modern dance offers a platform for me to freely integrate these two backgrounds through a mixture of intricate gestures, expressive faces, and clean lines, though most importantly – and I can really only attribute this to my own natural way of moving – I seek out dancers who bring elasticity to the stage, luxuriating in the movement one minute, then sharply recoiling the next. While I am visually most driven by light, movement, and textiles, I’d have to add that my artistic voice goes beyond the physical telltale signs onstage. It’s often the subject matter that’s the largest unifier of my work. 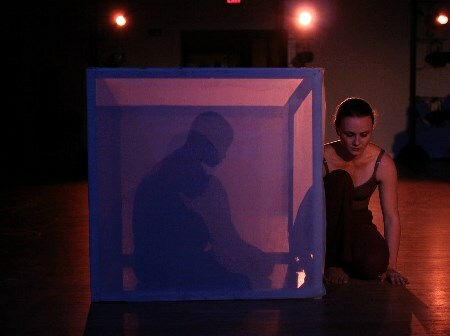 I find I gravitate towards creating pieces that are loosely narrative – pieces that personify themes of memory and connecting with one’s “past self,” achieved through interpersonal connections onstage, duets between dancer and light, and projected film across performers as canvas. It is an underlying current that keeps my creative mind running, whether intentional in its presence or discovered later on, and it has led to the creation of some of my key works, among them: Synchronic; What seems so is transition; Casting Shadows, Tearing Holes; Andromeda; Hush; The One I Keep; and The Woolgatherer. What does it mean to you to receive the Gold Star Award for the Night at the Tower project? Often as artists, we find ourselves working in a very insular world. Feedback – be it from mentors, press, or best of all the public – is a valuable commodity, as it gives us the chance to rework or expand upon our visions. That being said, never have I experienced such a steady outpouring of positive (and creative!) feedback from the public over one of my projects as I have for Night at the Tower. The production was centered around the celebration of Arlington: its residents, its artists, its history. 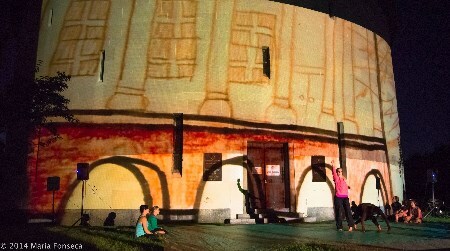 While rooted in the architectural and historic importance of the Arlington Reservoir (water tower) at Park Circle, Night at the Tower continuously grew to encompass a broader spectrum of the town, and – in the end – brought more than 300 viewers and participants young and old, professional artist to amateur, together for a celebration of what it means to share this town. Since the event took place in September 2014, I’ve received emails, calls, and letters thanking Luminarium for envisioning this project. I’ve received poetry and artwork inspired by the event, and have helped facilitate new collaborations between musicians and performers who reached out due to something they saw, heard, or felt that evening. In fact, not a month has gone by (now June of 2015) that we haven’t received an outreach related to the event! I could not be more grateful (and frankly, relieved) to receive this positive outpouring from the public. Yet to receive the Gold Star Award from the Massachusetts Cultural Council takes that gratitude one step further. When I was first informed of the award, I learned that our project had been selected as one of three out of 5,000+ government-funded projects across the state in 2014. This number was staggering to me, and served as a reminder of where the initial funding for our production originated, let alone how important it had been. It’s a wonderful feeling to discover that while my work was being realized – thanks, in part, to funding from the Arlington Cultural Council and the MCC – so were five thousand other artists’ visions becoming a reality. Let’s pick “worst” since that’s always fun to look back on… Graduating college, it quickly became apparent that my graphic design skills would likely be the best route to sustaining myself as an artist. I answered a Craigslist ad (always a smart move) looking for a designer and soon found myself creating those delightfully tacky full-page car ads you find on the back of newspapers. I became used to hearing the line “Wow, you’ve got such a good eye; this is gorgeous. But you know what this needs? A big yellow burst… behind every car. And let’s make all the type bigger, bolder, and red – Oh! And let’s add a Santa popping out of the sunroof.” (It was not December.) I escaped after three months with my artistic integrity hanging by a thread, but had gained the super power to correctly name every car color on the road, from Electric Wasabi Green to Blackberry Pearl. What isn’t! The sky’s the limit, as far as I’m concerned. (But until our hot air balloon funding comes through…) In our immediate future the company is gearing up for its 2015 feature production Spektrel, which debuts October 27, 29, 30, and 31 at the Multicultural Arts Center in Cambridge, featuring new works that accentuate Luminarium’s powerful theatricality through otherworldly shadows, light play, and colorful abandon. We’ve also just selected this year’s 24-Hour ChoreoFest participants – our annual overnight festival with performances on Saturday, September 5. And for me, personally, my focus is currently turned towards this year’s Cultural Community Outreach Project – an annual project I lead that uses dance and art to highlight a local historic or cultural landmark. Last year’s project was the aforementioned Night at the Tower. This year, Luminarium is partnering with the Eric Carle Museum of Picture Book Art in Amherst, MA, to create a new children’s storybook using images and writings submitted by the community, which Luminarium will reinterpret with a video projection/choreographic twist. Artists and writers of literally all ages in the greater Amherst region (or Pioneer Valley) should visit http://www.luminariumdance.org/#!amherst-storybook-project/cup5 to learn more and submit their work for inclusion. The deadline for artwork is June 30, and the deadline for writers will be in August. The grand unveiling (along with a 20-minute performance and Q&A with the company) will take place at the Eric Carle Museum on Sunday, November 8 at 12:30 and 1:30pm. Many thanks to the Amherst Cultural Council and the MCC for giving us the initial funding for this project! Luminarium Dance Company receives the MCC’s Gold Star Award at the 5th Annual Gala and Showcase at Arts at the Armory in Somerville on Sunday, June 21, 2015, 5-8 PM. 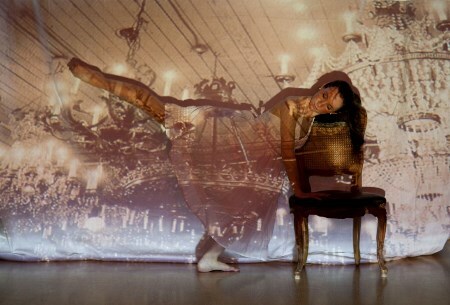 Merli V. Guerra is a professional dancer and award-winning interdisciplinary artist with talents in choreography, filmmaking, art, and graphic design. 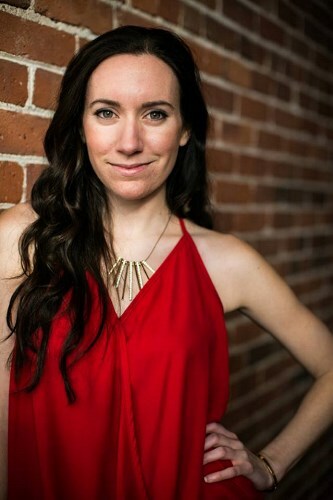 She is co-founder and artistic director of Luminarium Dance Company and production manager of Art New England magazine in Boston. Guerra has performed lead roles on international tours to India (2007, 2012) and Japan (2009), with Brazil on the horizon, and is a senior contributor for The Arts Fuse, as well as the writer behind the blog Arts into Motion. Guerra frequently acts as a panelist, judge, guest choreographer, critic, speaker, and advocate for the Boston dance community. To learn more about her work, please visit merliguerra.com or luminariumdance.org. Images: Luminarium Dance Company performs at Night at the Tower (2014), photo by Maria Fonseca; Merli V. Guerra, photo by Shane Godfrey; Luminarium company members Jennifer Roberts and Katie McGrail perform Guerra’s Hush (2013), photo by Ryan Carollo; Luminarium company member Jess Chang performs Guerra’s The One I Keep (2013); Merli V. Guerra, photo by Kristyn Ulanday.